Our latest Lake Erie Toolworks Workbench Idea for November 2017 comes to us from Marcel K. from Auckland, New Zealand. 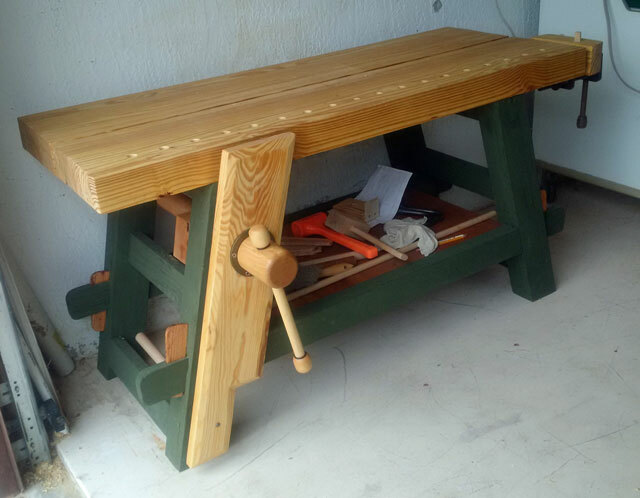 Marcel has built a tremendous Moravian Style Workbench using the Will Myers Moravian build DVD as his inspiration and guide. Kudos to Marcel, as well as to Will Myers and Joshua Farnsworth for helping to make this reality happen. I can’t believe it took me this long to build it but I finally finished my workbench. Not sure whether it meets the standard of the other awesome workbenches in your blog but I thought I’d fire some pictures and text (below) through to at least show that the vise has eventually been put to use. And of course let you know my appreciation of your vise screws. When I first saw Will Myer’s WKFineTools article on the portable Moravian design I knew it was a perfect choice for the tight confines of my garage. Basically I wanted something that was solid/heavy yet not too big and could still be relatively easily moved when needed. The only thing I wanted to change was the tool tray as I preferred having extra bench space so to SketchUp I went and started working on modifying the design to incorporate the Roubo split top idea. After a year of pondering (while building my tool chest) an article appeared on the Lake Erie blog about a great compact version of a “Split Top Moravian” from Ron G in Florida which confirmed my ideas. While finishing my tool chest I bought Will Myer’s fantastic DVD (“Building the Portable Moravian Workbench”) and watched it repeatedly while acquiring the lumber and letting it dry a bit. After purchasing the Lake Erie Toolworks vise screw I set to work in December last year. Yes it took me about 10 months of working off and on to complete! I did nearly all of it by hand (rough-sawn stock dimensioning, joinery etc) and only submitted to power at the end to cut the back slab to final width using a circular saw. By then I thought I’d had enough hand sawing practice! The bench is all white ash apart from the maple Lake Erie vise screw. Even the various dowels were formed from scrap Ash used during the build (hardwood dowel is hard to come by in New Zealand). I went with a Veritas inset vise for the end vise due to its compactness since the design doesn’t have much space at the bench ends to add a vise. 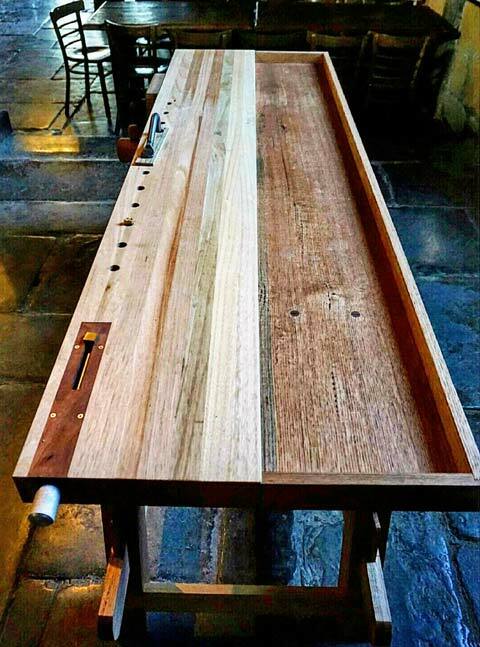 The overall length and width of the bench matches Will’s plans (76″ x 24”). The top slabs are asymmetrical with the front one about 12.75” wide and the back about 9.5” separated by a 1.75” slotted gap stop. This means that I have the option of building a tool tray like the original plans if I want in the future. It also means that with the gap stop in the raised position I can comfortably hand plane a 12” or so wide board against the stop. The thickness of the top is 4.25” which is thicker than the original plans (3.5”) and the legs and stretchers are also a bit thicker than the plans so the bench is certainly heavy when assembled. I haven’t weighed it but the front slab alone is at least 40kgs (about 90lbs) so while the bench is technically portable you wouldn’t want to move the front slab too far by yourself! 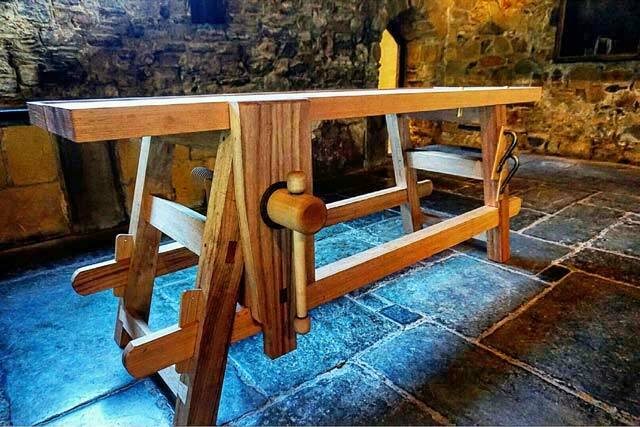 The bench and vise are finished with Organoil’s Danish oil which is one of my favourite finishes. A straight oil finish that’s easy to apply and doesn’t leave a varnish/film finish and smells pine fresh which is a bonus :-). The top still has a bit of friction which is great when working on it. 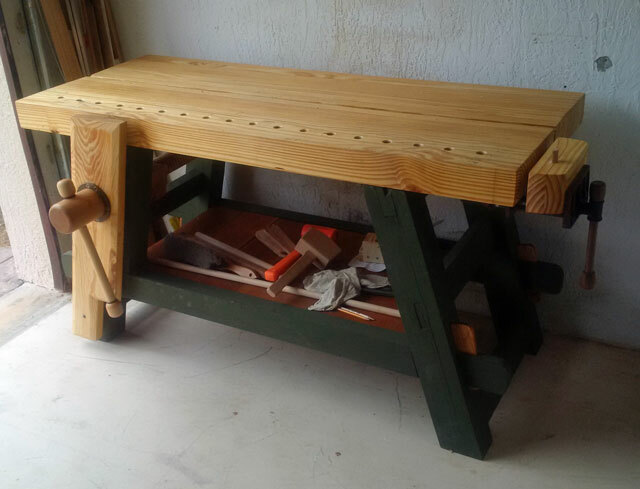 There are still a few details to finish off including boring some more hold-fast holes, adding some cork or leather to the leg vise jaw and adding a loose tongue and groove lower shelf but the bench is up and running and the leg vise works awesome. I was expecting a fair bit of initial “squeakiness” before wearing it in but the Danish oil and paste wax on the screw threads have it running smoothly already. Apologies for the quality of the pictures but they give you an idea of how small my workspace is. Basically the workbench and my tool chest sit on some rubber mats about 8’x8′ in size and that’s my entire workspace. Also shown in the pictures is the gap stop in the raised position and the vise screw. 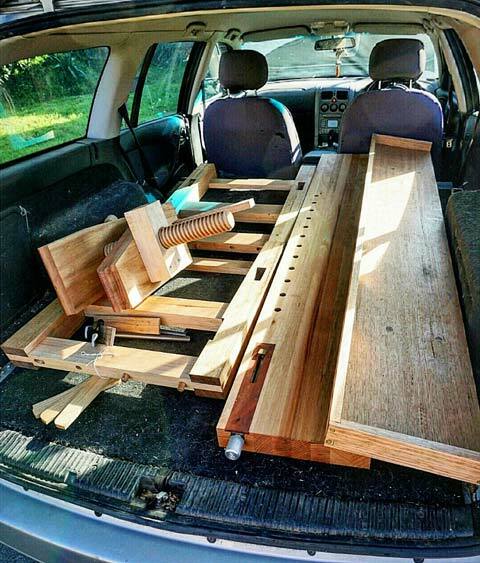 If a project I’m working on needs more space I can temporarily move the car out of the garage, partially disassemble the bench tops, rotate it 90º and reassemble to give me extra room on both sides of the bench. Big thanks to Lake Erie for making such wonderful vise screws. When it arrived I wasn’t sure whether to use it or put it on the shelf as a work of art it looked so amazing. Big thanks as well to Will Myers (and Joshua Farnsworth) for creating the workbench DVD which I highly recommend and also to Will for taking time to answer some queries I had on the design. Workbenches – Which Path Do I Follow? When a woodworker makes that fateful decision to build their own workbench, the next logical step is – what style of workbench do I build? Roubo, Nicholson, Moravian, Scandinavian, etc. Then there’s the many other factors such as: what type of wood should I use, what type of finish do I need, how tall or wide should it be, should it be a solid permanent workbench or a knock-down transportable type, how much should it weigh, what kind of vises should I use, and the list goes on. It also might be heresy for me to say, but a fully wooden vise screw & nut isn’t always the proper choice for every woodworker given their own personal situation. There are times & circumstances when a metal vise screw is the best way to go. The short answer to what type of Workbench you should pursue is, IT DEPENDS. By giving all of this a lot of honest thought and after a bunch of research using the many fine workbench building resources that are out there (Books, DVDs, Websites), you will eventually land on a workbench path that you must follow. The key is that everyone should chart their own personal path to their own workbench nirvana. Until then, I’d like to point you to some additional resources that you can find on our “Links/Info” section of our Lake Erie Toolworks website. First off, we have a section called “Workbench Ideas” that has a huge number of workbench styles for you to peruse & consider on your path to personal discovery. 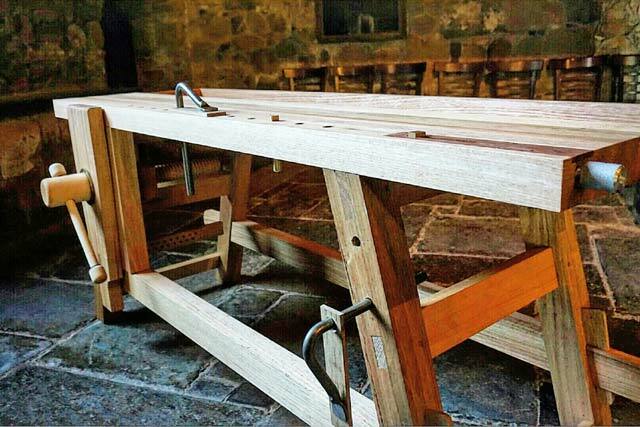 We also have several links for you to follow to check out Will Myer’s workbench builds for his Roubo, Nicholson and Moravian Style Workbenches. There’s also a link to a Workbench video series from Paul Sellers that I think many of you will find very informative. 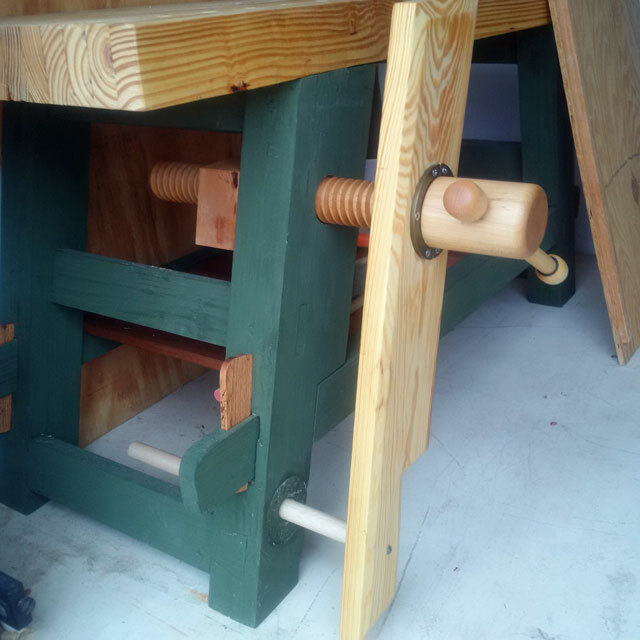 Our August 2015 Workbench of the Month comes to us from Ron G. from Wellington, Florida. 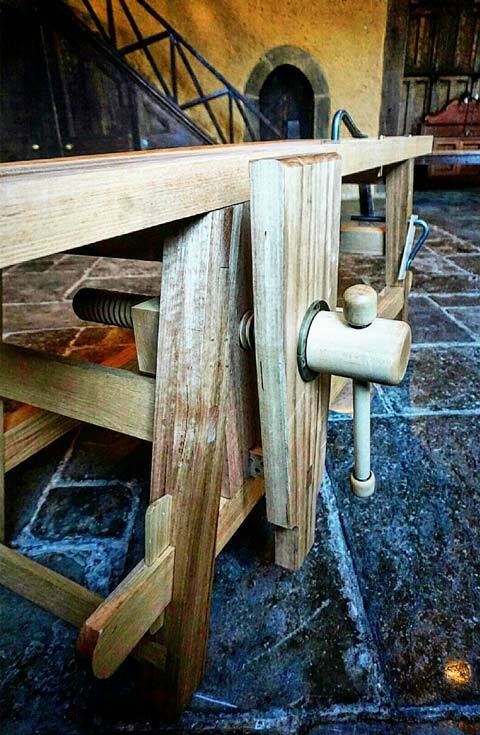 Ron has built a great Moravian Workbench with a leg vise that is patterned off of our good friend Will Myers’ Moravian classic and we think you’ll agree that the workbench turned out fantastic. It is the first workbench I have built and one of the larger projects I have completed. It is built completely‎ from southern yellow pine (except the tusk tenons which are scrap oak). The only local source I could find was a large lumber yard that would not let me pick through the pile, so I had to take what I got. There were inconvenient knots and edge runout. I was able to work around or sandwich most of the defects. Given the space available, I settled on a size of about five feet long and two feet deep. I bought 2 x 10 10’s. I planed then down to a uniform thickness, removing most of the rounding of the corners in the process. For the top, I ripped them to 3 1/2″ inches and glued up the two top sections which I then used my thickness planer to make a uniform thickness. The legs were also glued up ‎from the 3 1/2″ pieces. Other parts were ripped and cut to size. I chose to use a split top with no tool tray… I wanted the additional work surface and knew a tray would just collect junk. Splitting the top with a gap accomplished three things: it made the top sections light enough to be movable by one person‎; it gave me a place to put chisels where they wouldn’t roll to the floor; and it meant I did not have to make the facing sides perfectly mated. I rabbetted‎ the inside edge of the long stretchers to allow me add a (removable) shelf. My end vise is an old Wilton that was salvaged‎ from the workshop of a friend’s dead father. The front vice is a slanted leg vice. I did not want to obstruct the shelf with the additional structure needed to support a vertical vice. I did have to widen the left, front leg to make sure there was enough support for the screw. The screw hardware is yours (Lake Erie‎ Toolworks). For the parallel guide, I tried something different. I got a 1 1/8″ oak dowel and drilled a larger hole through the leg. I then flush mounted a deck mount for steel pipe that was slightly larger than the dowel. I am hoping that the thread will catch on the dowel and keep things parallel. Time will tell (though I expect I’ll need to fiddle with it). I got a pair of the Gramercy holdfasts and am very happy with them. The base is finished in milk paint – I was concerned that it would rub off the leg onto work, but I emailed Megan Fitzpatrick to ask about her experience with her painted bench and she told me not to worry. The top and vise‎ chops are finished with three or four coats of a homemade mixture of boiled linseed oil, varnish, and mineral spirits (1:1:1). Most bench builds I’ve‎ seen seem to take place on an already constructed bench. This was not an option for me. I used a pair of rickety saw horses, at Black and Decker Workmate, and the floor of the garage (the only thing I had that was sturdy enough on which to chop mortises). Working on the garage floor was interesting – it reminded me of those old prints of Japanese woodworkers. On the other hand, the wood chips and other debris left marks in all the wood. Oh, well. My hand cut partial thickness dovetails look like crap. This was true of most of my joints – no matter how carefully I laid them out and cut them, they looked sloppy when glued up. More importantly, however, they were solid. I screwed up when making the saddle joints for the short stretchers across the top of the legs. I chose to make the long dimension parallel with the face of the bench to try to increase stability. Unfortunately, this made the glue joints in the legs parallel‎ with the‎ short stretchers. When I inserted the short stretcher to glue it, despite having test fitted the joint, it split the leg’s glue joint. I used small jig (sort of visible on top of the sheet of paper on the shelf) to keep my bench dog holes lined up. The drill bit was a 3/4″ Irwin Speedbor. It has a lead screw and three flutes. It’s incredibly aggressive (almost scarily so) and just tore threw the benchtop. I’m really happy with the finished bench. It is solid and heavy enough to not move when in use. It holds‎ work well. The fit and finish could (should?) be better, but it’s incredibly functional – and that’s what really matters.